Black trim and rubber can fade with exposure to UV, harsh weather, acid rain, road salts and general contamination picked up during the course of driving. Restoring the deep black colour completely changes the appearance of a vehicle. 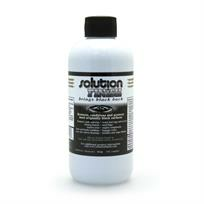 Solution Finish Black Trim Restorer was designed by professionals with professionals in mind. The silicone-free formulation uses advanced polymer technology to produce a long-lasting finish. Trim Black Restorer is suitable to use on a variety of substrates to re-blacken tired and faded appearances to like new.